Gabrielle McCallaghan just lost her job. Seeing the writing on the wall, she quit to spare her uncle the embarrassment of having to fire her. With her bond fairy on her shoulder, she strides through a crowded neighborhood contemplating her options. Out of nowhere, a gorgeous, full blood magic wielder appears and makes a beeline right for her. 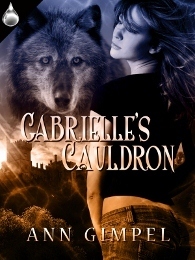 Gabby knows her hybrid witch magic is no match for his, so she tries to evade him. The fairy does her best to help, but the contest is laughable. Even in his human form, the wolf-man is still stronger than she ever dreamed of being. It doesn’t take long before Gabby is drawn into a deadly game of intrigue that started over a thousand years before. The stakes are high and the timing abysmal, but she finds herself falling in love in spite of herself. Can she and her full blood lover make a life for themselves? Or will the long-running battle between full bloods and hybrids pound the fragile bond between them to dust? Ann Gimpel: Herr VonBethel, so nice you could free up some time to talk with me today. AG: I understand perfectly. I thought you might want to tell our readers how you first met Gabrielle. WVB: (Smiles broadly.) I was walking down a Seattle street and I felt this amazing energy coming from the other side. To be honest, I’ve never felt anything quite so, ah, stimulating. Of course I had to discover its source. AG: (Leans forward.) What did you do? WVB: Opened my magic senses and let them transport me right to Gabrielle. Of course by then she’d ducked into a fancy lingerie store. I followed her and had to practically beat the shop girl into submission. I thought she was going to rip my clothes off on the spot. AG: (Grins) Well, you are quite a handsome man. Those golden eyes are stunning. I’m sure you’ve often gotten that response from women. WVB: (Colors slightly) Of course. I’ve even, um, taken advantage of it a time or two, but those days are over. Now I’ve found her, Gabrielle is the only woman for me. AG: Glad to hear it. So things are going well between the two of you? WVB: Couldn’t be better. Little vixen’s got quite the aptitude for magic. It’s amazing what the two of us can do together. AG: So long as you brought it up, why don’t you tell the readers what you are. WVB: (Stands and bows) I am a full-blood magic wielder and a warg. That means I can shift to wolf form at will. I am also quite old, close to a thousand years. AG: How are you different from, say, a werewolf? WVB: I control the transformation. I can choose which form I want. Another difference is my magic is equally strong in both forms. AG: If you and Gabrielle have children, do you suppose any will be wargs like you? WVB: (Shrugs.) Hard to say. It will depend on how the genes combine. Gabrielle’s magic is quite potent in its own right. AG: What’s next for you and Gabrielle? WVB: We’re still working to end the animosity between the hybrid magic wielders like her and the full-bloods like me. I fear that will take years, even with the fairies helping. Yet it is a worthy goal and we will not stop until it is complete. AG: That’s why you’d come to Seattle in the first place, isn’t it. WVB: (Nods.) Yes, I’d planned to try to gain her coven’s cooperation. I’d been beating my head against a wall with my own kin for hundreds of years. AG: So glad it all worked out. WVB: (Eyes me sharply.) I’ll just bet you are. It means you still have a planet to live on. WVB: (Interrupts) They’ll have to read Gabrielle’s Cauldron then to figure things out. AG: (Laughs.) Thanks for the pitch, Warin. Couldn’t have said it better myself. It was a pleasure to meet you Warin(: I can’t wait to get to know more about you and Gabriell in Gabrielle’s Cauldrone! Thanks so much for hosting me! I love writing character interviews, especially when the characters cooperate. One I wrote, I practically had to bring out the hook to drag him off stage! Thanks, Katie! Warin would be intriguing to meet in the flesh! Love those alpha males. Shifters are so much fun as characters. They can have the best of all worlds: human and animal. Fascinating character, and fascinating questions.